Sometimes these winter months just seem to never end, and if you’re anything like us, you are just itching to get started on spring activities. The start-up of your irrigation system is one of the most important services performed. During this process, all aspects of the sprinkler system are tested, adjusted, and programmed for the desired result. This inspection process ensures that the system is running smoothly and effectively. But the work doesn’t end there! It is a common misconception that lawn sprinklers are a “set it and forget it” tool. Systems should be checked regularly throughout the season, by a qualified technician who has been trained to look for inadequacies in a complex design. By staying on top of your system throughout the season it will elevate the efficiency of your system and watering schedules which will deliver homeowners with their desired end result. Incorrect placement of sprinkler heads can lead to gaps in coverage, allowing plants in untargeted areas to die and constantly require replacement. Incorrect placement of sprinkler heads force homeowners to increase watering times in an attempt to increase water to lacking areas, causing overwatering in other areas. Overwatering will drown root structures and cause plant material to die, ultimately requiring replacement. Mismanaged watering schedules can result in extremely high water and sewer bills each quarter. It is because of these reasons why Fisher Irrigation Systems prides itself on having all of the knowledge and background skills capable of providing you with the best possible sprinkler systems for your home. It is our experience and attention to detail that have set us apart from our competitors for the last 35 years. We bring with us an excitement for each new project, along with an unmatched level of workmanship that is unrivaled. Spring is an exciting time for homeowners to get going on all of the projects that they have been waiting on during the cold winter months. As a general rule of thumb, most of your spring plantings should be in by Mother’s Day. With that timeframe in mind, it is always a good idea to have your sprinklers started for the season before these plant materials have been installed. 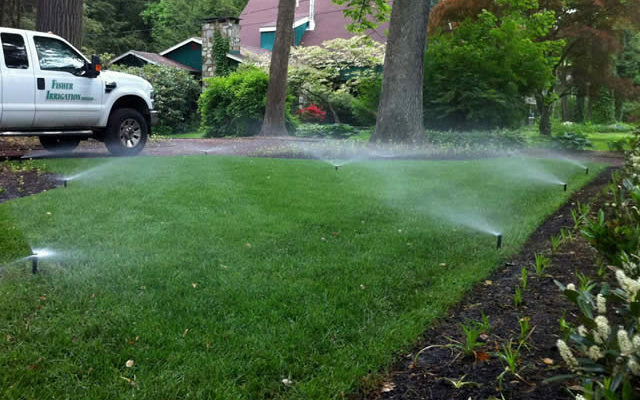 During the spring start-up of your lawn sprinkler system, one of our qualified irrigation technicians begins by pressure testing the main line piping to make sure it is intact. They will then begin to test each individual irrigation zone, checking for proper watering coverage of all of the sprinkler heads and making adjustments as needed. Once they have completed going through all of the irrigation zones, they will test the rain sensor. A rain sensor is extremely important during the spring months when we typically experience wetter conditions. When a rain sensor collects enough water, it will automatically shut down the irrigation system until it dries back out, saving hundreds of gallons of water when your property does not need it. Lastly, the irrigation controller will be programmed for a light spring watering cycle. The key with spring time programming is always “less is more.” It is always easy to run an additional watering cycle if it is needed, but it becomes very difficult to take away too much water once it has been expelled. Having your sprinkler system all set and ready to go before your spring plantings allows you to water your plants the same day they are installed. It also ensures that any potential damage to the system during the winter months has been taken care of in time. Are you having any seeding applications or other property treatments this season? Our technicians would be happy to mark sprinkler lines or flag individual sprinkler heads during the start-up procedure to assist in avoiding any problems. 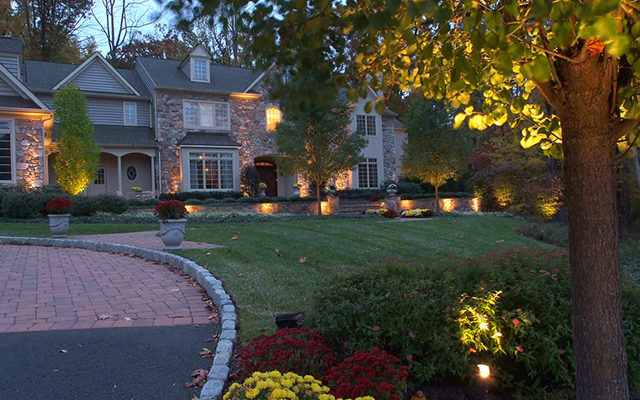 Do you have a low voltage lighting system? Our friendly service technicians will also check your lights and re-program the clock while we’re out on the property at no additional cost! One stop shopping to help get your property all set-up for the spring! 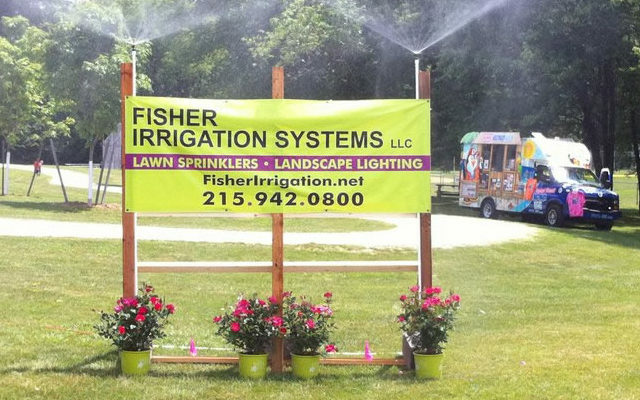 Call Fisher Irrigation and Lighting today to schedule your appointment at 215-942-0800.